Ilkka please tell me what are the benefits of cutting the corners of the front wall at 30 degrees like on page 18 in your https://www.genelec.com/sites/default/files/media/Studio%20monitors/Catalogues/monitor_setup_guide_2017.pdf . 5/7/18 12:51 AM as a reply to adriantatar. It's for managing the lower or bass frequencies. Easiest to use bass or corner traps, works great. Can be used in every corner of the room, wall/ceiling & wall/floor. 5/7/18 2:03 AM as a reply to adriantatar. The drawing on page 17 shows a 2d plan view of soffit mounted main monitors, as the drawing shows, this type of design reflects first order reflections away from the mix position. 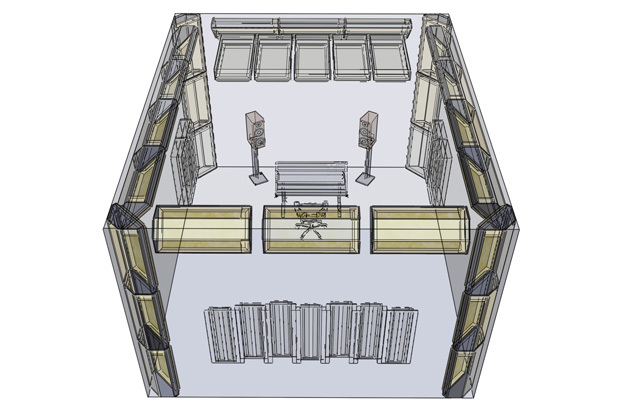 This type of room usually has the main monitors installed in an extremely high mass front wall that ensures that the monitor is operating in a half space acoustic environment, this eliminates any reflections coming from behind the speaker. This type of installation requires great acoustic design and a lot of expenditure on construction. As manutal has shown, in a conventional room, keeping the speakers out of the corners is very important, it greatly reduces the severity of first order reflections and boundary gain from the corner. Read the guide carefully, it covers all the basics you need to understand to get your monitors working as best as possible in your room. Stereo no sub: If working in a room less than about 6 meters is to place the speakers as close to the rear wall as possible, this will minimise the reflections from the rear wall getting to your listening position, then using the DIP switches on your monitors, or GLM if you have SAM products compensate for the LF gain from the wall. I also strongly recommend getting the speakers up high, at least ear level, but usually higher. The fine tuning of your placement will come from simply listening if you don't have SAM monitors.... If you have SAM monitors, simply look at the response curves and play around with different positions for both the monitors and your listening position, we are talking about fine tuning here, so still working from the setup guide, just massaging things a little. Stereo with Sub: the sub has to be up against a wall, i usually use the wall the speakers are on, and the sub should just be to one side of the centre of the room. Your monitors can be either close up against the wall or at least a meter away if you are using 85Hz as the x-over... everything from above also applies.